Due to a solid amount of procrastination, combined with the false assumption that I had already written this post, I'm about to talk about something a little bit dated. Nevertheless, it is still relevant and highly meaningful to me. Bear with me. What you're looking at is a simple little piece of stretchable fabric, but stitched on in green and red is my brigade symbol, battalion symbol, and finally, my induction class date. This fabric is a watch cover. Its purpose is to hide any glinting from the sun while in the field, while in any type of situation necessitating secrecy. You put it around the band, and then when needed you pull it over the watch face. Very simple. Nothing to it. 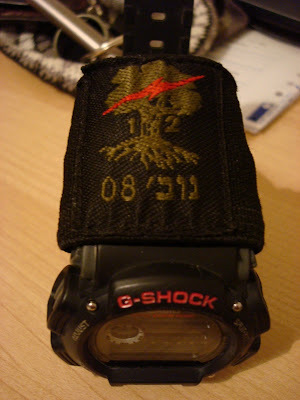 But, what you can't even begin to understand unless you've gone through this stuff, is that finally I've received something to be worn at all times that declares that I am a member of Golani. Though I didn't write about it, I received the Golani shoulder tag a couple months ago (I can't believe that I never wrote about something so important to me). Even though the shoulder tag is the second most important part of the dress uniform, maybe the most important, the watch cover is the only thing you wear even in civilian clothes that shows your units. Golani is known for a few things: disobedience, a Sephardi makeup, a lack of discipline, and most importantly, esprit de corps. So when you work for two months, as we did, with nothing to show for it, you start aching for some recognition. You see, all the combat units, and probably many non-combat units, are decked out with their symbols. From watch covers to dogtag covers, to gun straps and t-shirts and sweatshirts, an IDF soldier is typically the proudest representative of any battalion and brigade known to man. Even if you're in artillery, an integral part of the army, it doesn't matter that everyone laughs at and disparages that branch of the service. You're still flying your colors for all to see. That's what's important in the army, if you ask one of us. It doesn't matter if we've just been drafted four months previously, seen no combat, or even have the beret for the brigade (end of advanced training). Our elitist perception isn't even dependent on whether or not we have a single piece of our uniform proving that we're in Golani! The exclusive esprit de corps of my brigade begins on draft day, because if you're lucky enough to be selected (3 out of 4 guys going into infantry request Golani), you are granted instant pride. The very first day it is drilled into us over and over again that there is nothing but Golani. It's like being in Harvard, only important. Everyone else is just holding us back. Can you see why it's so crucial, so meaningful to us when we finally earn something from our commanders, decided by the company commander himself? Despite all the ignobility of basic training, despite them telling us how we haven't done anything yet, how we aren't worthy, after all of that, they have deemed us worthy of displaying the symbols of our brigade. During basic they have to say things that aren't so pleasant. They can't really go around complimenting us. But the biggest compliment they could ever possibly give, through words or actions, is to allow us to wear these parts of the uniform. After all, they too are in the same brigade and battalion, so when we are finally given a simple watch cover, it's as if we are being accepted into their family. Our family. And the most important part of the watch cover, or the dogtag cover, or whatever bit it happens to be, is your induction date. November '08, it says. "We've Made It," we read. If you think I'm exaggerating or being overly dramatic, just go ahead and ask another Golanchik what he thinks. Pick any combat Golanchik off the street and say this to him: "The Paratroopers are better than Golani." I hope you have your teeth afterwards! "6) Whatever the fighter jet unit in the air force is called"
12 + 13 don't add up to 51! 51 rocks! Can you talk about the perception of the other infantry brigades? haha my sister's boy friend was in Golani Brigade 13, he sung me the Golani theme song, boy do Golani soldiers hate sanchanim! I was a combat engineer in the 3d Armored Cavalry Regiment, US Army. The unit I served with traces its history back to the mounted soldiers who fought the Indians on the American plains. Consequently, a big tradition is to wear a Stetson hat and spurs on your boots. This is earned through a spur ride in peace time (much like your marches for earning things), or by going to combat with the unit. I earned mine by going to Iraq. Each unit has its own traditions that are held very dearly. Also, in the 3d ACR when an enlistedman salutes an officer he is supposed to say 'Brave Rifles!' and the officers is supposed to return the salute and says 'Veterans!' You know who are the new privates and the new second lieutenants in the unit when either fail to say or return this greeting. There are more things I am forgetting but I just want you to know that the US Army does indeed have traditions. The Marine Corps, on the other hand, places more emphasis on the fact that every Marine is a Marine is Marine, which is why they do not wear shoulder unit patches while the Army does. I served in the Marine Corps Infantry from 1987-91, including Desert Storm. Marines definitely feel superior to other armed forces (Army) and grunts are of course superior to other Marines, except Recon. Cpl Peterson - Thanks for your comment. I wonder if you watched the show Generation Kill? I didn't read the book, but the show was pretty awesome. Definitely gave me a newfound respect for Marine Recon!